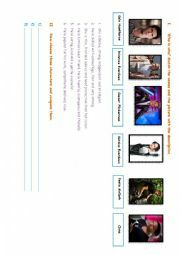 Here is a 4 page worksheet on the Hunger Games. After studying the previous one just with the trailer and a reading comprehension that I will upload very soon , I decided to study some movies scenes with my pupils. They loved it. 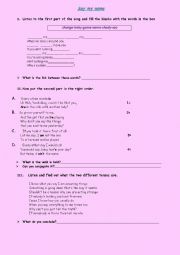 Here is a worksheet based on the movie elephant. I used it in class working on the Bullying theme with my pupils. 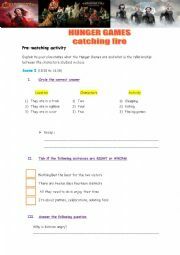 A worksheet on the Hunger Games to help the pupils use the comparative form studied in class. 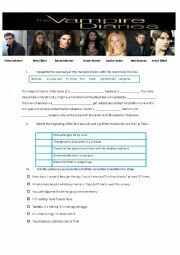 Hello everyone, this is a worksheet that I used with French students you can watch the first episode on various streaming websites It´s the first episode. Just to let you know there´s an exercise in French but you change the translation to your mother tongue . Hope you´ll like it! Enjoy! Here is a song that you use in your class. I usually include it in a musical theme. Hi everyone! 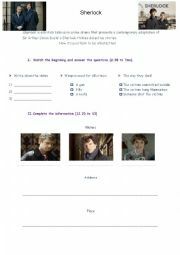 This is a worksheet about Great British Ghosts the tv show. You can find the link on youtube if you type the same title. It´s one of the worksheets I used to talk about ghosts, legends and superstitions. Enjoy! 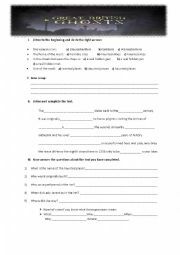 Here is a worksheet about the movie "When a stranger calls". You´ll find the exact minute corresponding to each exercise. There are no violent content so this is the reason why the students have to imagine the next scenes. Enjoy! 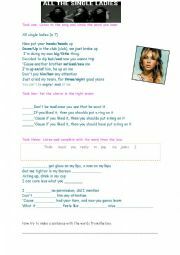 Hello Here is a worksheet that I did. It is a song that you can use to talk about the differences between the two presents followed by an exercise. Enjoy!